If you just wait around long enough, the future becomes the past. And that’s happened to the “Back to the Future” future, as you probably all remember. But BttF-themed projects are still pouring in. [ossum] sent us the link for his build of Doc Brown’s briefcase that only opens above 88 mph. His writeup is fantastically detailed, and worth a look if you’re interested in working with a GPS unit and microcontrollers, driving seven-segment LEDs with shift registers, or just driving too fast in an old Jetta. And there’s a video demo just below the break if you’re not a believer. [Renaud Schleck] somehow got lucky enough to find a GPS wristwatch in the trash. It had a broken LCD screen so its wouldn’t be of much use on that next hiking trip, but he knew it still had potential. 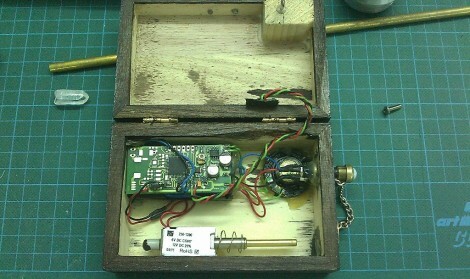 He used the GPS module and a few other parts to build this reverse geocache box. 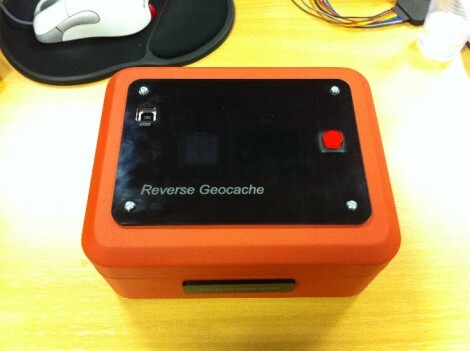 Reverse geocache is a container that is locked, opening only in a pre-defined geographic location. We’ve seen plenty of these projects around here, like this one that talks, or this one which was given as a Christmas gift. They’re popular projects both because of the unique method of getting at the prize inside, and because it doesn’t take a whole lot of hardware to build one. 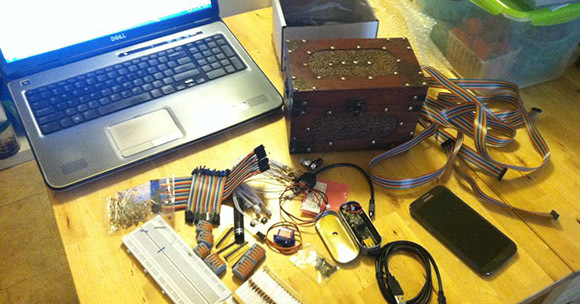 Once [Renaud] had the GPS module he simply need a user interface, locking mechanism, and a microcontroller to pull it all together. 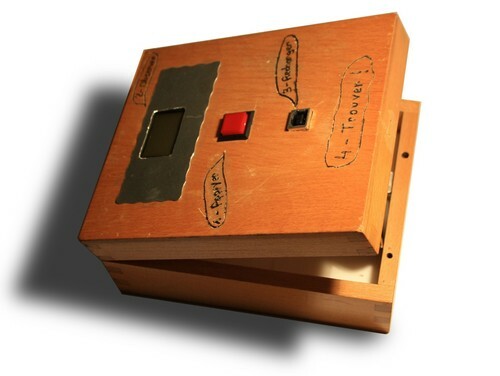 The interface uses a screen from an old cellphone and one push button. The latching system is a tiny geared motor salvaged from a Laptop optical drive. These, along with the GPS watch board are all monitored by the STM32 microcontroller which he programmed using OpenOCD and the Bus Pirate. Here’s a talking reverse geocache puzzle box which [Erv Plecter] built as a wedding gift for his friends. The box itself isn’t really the gift, but a surprise delivery system for a collection of cash from the couple’s circle of friends to go toward the honeymoon. We think this is about fifty times more fun that getting a fat envelope of bills. Who would really expect to find cash inside once you finally get to the target location? Unlike the other geocache box we saw recently, this one has no display to show you clues to the destination. Instead, it plays back audio clips which [Erv] recorded himself. They’re quite tongue-in-cheek which is another nice personal touch. The pin seen protruding out of the right side of the box can be removed to play a clue and check the location. It’s connected by a little chain to a 5 euro-cent piece which conceals an emergency release mechanism for the lid. The device is powered with a Lithium battery and can be recharged without opening the box via a USB port in the side. We’ve embedded the video demonstration of the box after the break. [Ranger Bob] crafted this great looking Reverse Geocache box. Our favorite feature is the black piece of acrylic on top. It’s laser cut (not sure if the letters are engraved or not) and gives a great finished look while hiding a couple of things at the same time. The orange box is a metal cash box, and there’s a smooth indentation in the lid where the handle resides when not being carried. [Bob] removed the handle and mounted the GPS module in that void. But there’s also an OLED display mounted next to it. As you can see in the demo video after the break, the screen is bright enough to be seen clearly through the smoky acrylic covering that depression. This project gave [Bob] the chance to order his first professionally made circuit board. He did the design in Eagle, managing to keep within the 5cmx5cm limits of Seeed Studio’s least expensive Fusion PCB option. The board hosts the PIC 18F87J50 responsible for handing the screen, GPS module, input button, and USB port. Power comes from an internal Lithium battery. We’ve featured a lot of Reverse Geocache boxes and they’re still one of our favorite projects because so much love goes into the design and build process. Here’s another one that we chose randomly for your amusement. Here is yet another offering in the Reverse Geocache puzzle arena. We’ve been getting a lot of tips about these projects but this one in particular stuck out from the others. [Mure] packed in a bunch of features, starting with the LCD screen seen above. You can just make out the single red button near the bottom of the image which is used to traverse the menu. 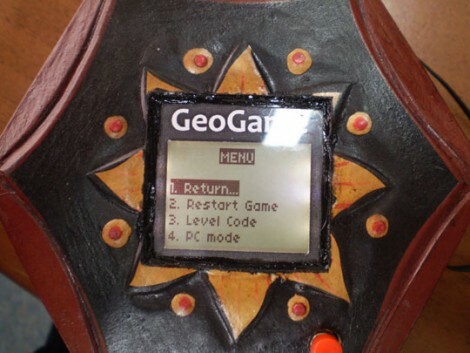 The octagonal box has an octagonal PCB inside that includes a USB connector. As you can see in the video after the break, this can be used for charging the batteries, and communicating with the internals. An accompanying program is used to generate puzzle data, which can then be programmed via that USB connection to set a new puzzle location. This functionality certainly protects against accidental lock-outs which were a problem with the last puzzle we looked in on.